Looking for a call center software solution for your USA-based business? Get a call center software with a free USA phone number and international call forwarding and dialing. Our contact center software comes complete with computer telephony integration, integrated voice response systems, voicemail recordings, automatic call distribution, call transfers, auto dialing, extensions and call monitoring. Use our analytics dashboards to take a closer look at the performance of your agents and manage your call center efficiently. Enjoy a fully-featured cloud call service at a much lower cost than any of our major competitors. View call center softwarealternatives comparisons to compare the cost of Nectar Desk to other providers such as Five9, Bitrix24 and Freshdesk. 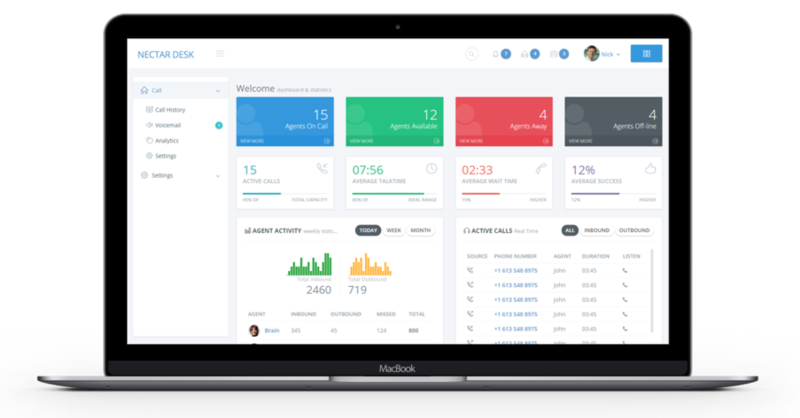 Use our free online CRM capabilities to merge your call center with CRM software such as Zendesk, Active Campaign, Teamwork Desk and Pipedrive. Automate key tasks such as logging calls. Create deals in your CRM directly from the Nectar Desk dial pad and much more. Get started with Nectar Desk today with a free trial. No credit card required.